YouTube, Vimeo, Dailymotion, VK and HTML5 video support. 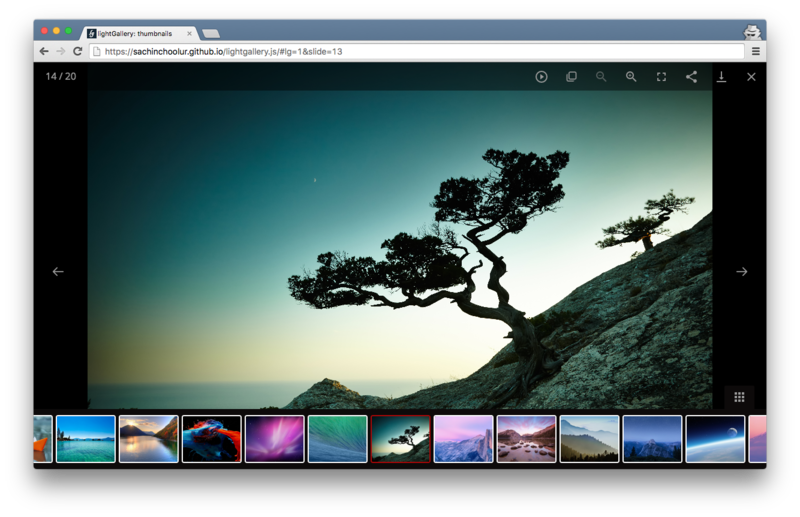 lightgallery supports all major browsers including IE 9 and above. You can install lightgallery using the Bower package manager. Then include lightgallery.min.js into your document. If you want to include any lightgallery plugin you can include it after lightgallery.min.js. lightgallery does not force you to use any kind of markup. You can use whatever markup you want. But i suggest you to use the following markup. Here you can find the detailed examples of different kinds of markup. If you like lightgallery please support the project by staring the repository or tweet about this project. Iframe. External websites, Google map etc.